Bluebell is not easily confused with other wild plants on this web site. 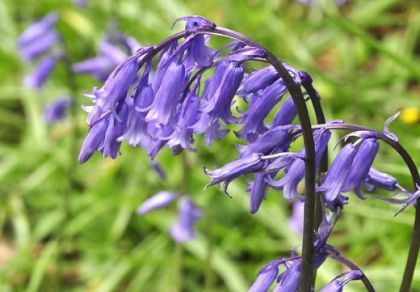 One of the most beautiful sights of our woodlands is to be seen from April each year when our beloved Bluebells spread a hazy, blue carpet under the trees and over grassy banks. These bulbous perennials have fleshy, glossy, linear leaves which are keeled and come from the root. At the tip of the leaves is a little hood. The long racemes or spikes of four-to-fifteen, drooping, tubular, purplish-blue flowers are one-sided, the leafless stems curving over gracefully. Each flower (14-20mm long) has cream anthers and six backward curving lobes. 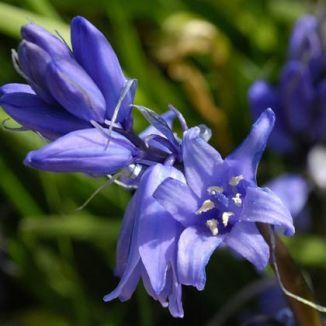 The latter point makes it easily distinguished from its competitor, the hybrid - Hyacinthoides x massartiana - between the introduced Spanish Bluebell (Hyacinthoides hispanica) and our native Bluebell. This hybrid has non-curving lobes and also differs in that its flowers are not in a one-sided spike. The anthers in the hybrid are blue. Bluebells bloom from April to May. The fruits are egg-shaped capsules with black seeds. This is a native plant belonging to the family Asparagaceae. My first memory of Bluebells is seeing them on the road between Laragh and Glenmalure in Co Wicklow in the 1950's. I passed along that road recently and am happy to say they're still there. The photographs were taken at Wellingtonbridge Co Wexford in 2005. '…in falls of sky-colour washing the brows and slacks of the ground with vein-blue' and of 'light beating up from so many glassy heads'.